Westview proudly recognizes Esmeralda Alvarez as Employee of the Quarter. Esmeralda has been with Westview since 2007 when she was hired as a program coach for the L.A. County, Lakewood Inclusion Program. She immediately demonstrated strength in developing and implementing client activities: art, community sports and recreation, parties and social events. In 2009 Esmeralda was promoted to Senior Coach for MRL Along with more organizational duties, she continued to support and advocate for clients and began making time to regularly contact their parents updating them on their family member and program activities. She was soon known as the human link between parents and Westview. As senior coach, a major part of Esmeralda’s time is dedicated to seeking out new activities, developing activity calendars and providing program tours for newly referred clients. Esmeralda has been instrumental in the successful enrollment of five new clients within a twelve month period. She has developed partnerships with local bowling alleys, adult schools, the landmark Watts Tower (art classes), Los Angeles Parks and Recreation and senior and community centers throughout the Los Angeles area. In August 2013 Esmeralda assumed the Senior Coach duties for the LA County Community Based Program. Esmeralda is a highly respected and a valuable figure within Westview. She is appreciated by everyone she serves. Thank you Esmeralda for your Dedication and Service! 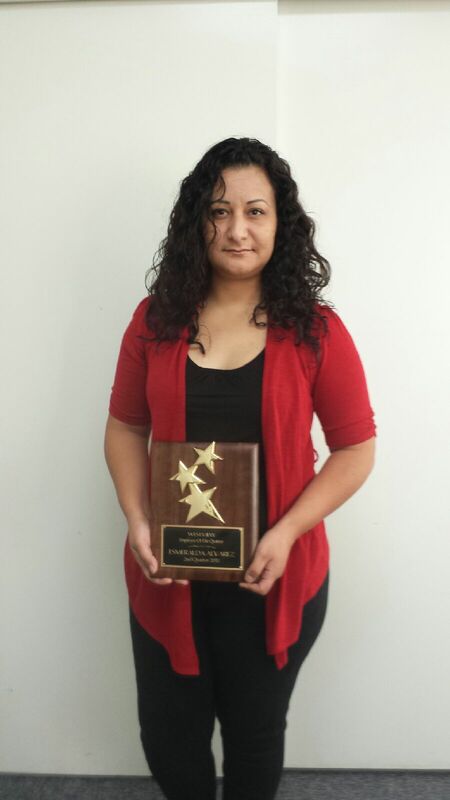 Virginia Rangel, a client of Westview’s Supported Employment Program, was honored with the Consumer Award. Virginia has distinguished herself as an employee of Home Depot in Huntington Beach since 1992. Virginia was featured on Fox 11 news on September 1 as a part of its Jobshop series. Virginia’s accomplishments extend even beyond the setting of Home Depot. She has been instrumental in working through Home Depot’s Community Service Program to provide special projects for different Westview programs. With Virginia’s help, Home Depot installed a bocce ball court and landscaping at Westview’s Starlyte program in Westminster and provided garden plants for Westview’s Community Arts program in Anaheim, Daystar program in Fullerton, and Starbright program in Santa Ana. Virginia helped start a new chapter of People First at a Westview location and is its current president. Through People First, she has been a leader in promoting self-advocacy for people with developmental disabilities and has helped instill within them a sense of community and political awareness. She has also helped grow the organization by making other consumers aware of the possibilities within themselves. 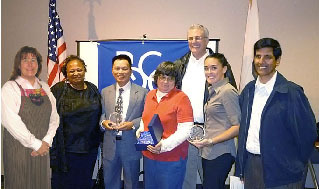 Khanh Troung, coach of the Garden Grove program, was the recipient of the Frontline Award, which recognizes an "individual whose direct service to people with developmental disabilities has demonstrated exceptional ability to enhance the life of one or more RCOC consumers.” Mr. Troung has consistently demonstrated his readiness to go above and beyond in serving his clients and Westview, including making hospital visits when his clients were ill, helping his clients and their families on his own time during weekends, serving as a Special Olympics volunteer, and mentoring new coaches. Home Depot was presented with the Employer Award, which recognizes "exceptional leadership and creativity in expanding integrated employment opportunities for people with developmental disabilities.” Home Depot employs fifteen Westview clients at its various stores in Orange County and is a forerunner in recognizing that disabilities are not barriers to one’s ability to work productively and conscientiously. Home Depot has also given back to the community by providing plants, landscaping, and a bocce ball court to various Westview Orange County day programs, significantly enhancing the quality of life of Westview’s clients with more severe disabilities. Westview is honored to have its nominees selected as recipients of the RCOC Spotlight Awards and congratulates them on receiving these most deserving awards. We thank them for all they do in showing us the meaning of selfless service.